Please contact us for a Boat Lifts quote. MARINA QUALITY FLOATING BOAT LIFT. Our Shallow Water RhinoLift lift utilizes a longer, low profile RhinoLift air tank to allow for use in shallow and fluctuating water applications. These industry-leading polyethylene tanks allow of operation in water depths as low as 22 inches (plus hull depth). Utilizing the time-test L-Arm design our Shallow Water Lifts are built to withstand the harshest of marine environments and provide the ultimate in strength, durability, and performance. Trust the experts at RhinoLift Products and get the peace-of-mind the comes with over 40 years of handcrafted, expertly welded, marine experience. LOW PROFILE RHINO MARINE TANKS (14.25" tall) allow of operation in lower, fluctuating water depths. Minimum water depth required is 22 inches plus hull depth. WELDED AND GALVANIZED steel frame for superior strength and corrosion resistance. MARINE-GRADE FASTENERS AND BUSHINGS provide quiet, lasting performance in nearly any waterfront conditions. RHINO MARINE TANKS are rotationally molded for durability and impact resistance. PREMIUM RHINOLIFT CONTROL UNITS available with or without a remote. L-Arm RhinoLift floating boat lifts offer a wide range of accessories to fit your boat, pontoon or tritoon, and premium RhinoLift control units are available with either manual, or remote control operation. RhinoLift boat lifts feature premium RhinoLift control units available in either manual operation or remote control operation. When entering or exiting the lift in wind, currents or choppy water, RhinoLift Arm Guards can add additional protection for your watercraft. Guide-ons act as a centering for properly storing your watercraft on the RhinoLift. Horizontally adjustable for a perfect fit. 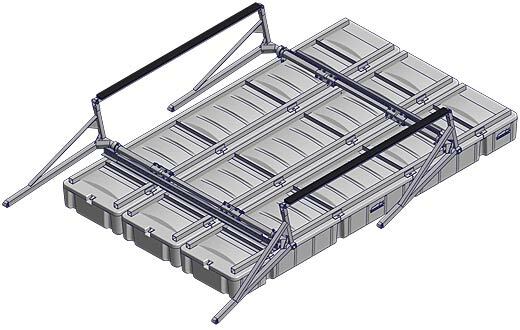 RhinoLift lift bunks feature marine grade carpet and vertically and horizontally adjustable for your boat or pontoon. 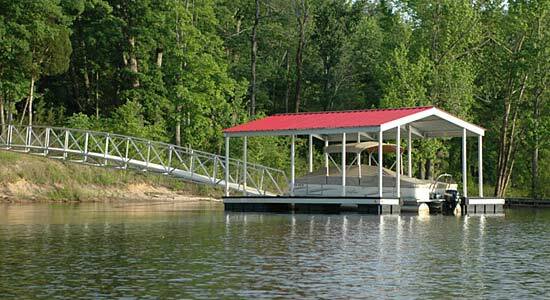 *Choose an L-Arm or 4 corner style RhinoLift floating boat lift when you have a full slip available and can attach the lift to the dock walkways with dock connector brackets. **Frame Height with Tanks; tanks are each 26" tall x 28" wide x 12.5" long. *** 22" plus depth of boat hull.